Good Things have recently launched a new range in the Argan Oil line, which consists of a Moisture Boost Serum, Facial Oil, Cleansing Oil and Day Cream. Having recently come to the end of my Camomile Silky Cleansing Oil from The Body Shop, I was keen to give the Argan Oil Cleansing Oil a try so popped into Boots to pick a bottle up. If you're not familiar with the Good Things brand, there's a little bit of background information on the bottle: "Good Things facial skincare has been developed by award-winning beauty writer Alice Hart-Davis using her years of expertise in the beauty industry. Combining antioxidant-rich Argan Oil with intensely nourishing and moisturising ingredients, the Good Things Argan Oil range has been expertly developed to help target and treat signs of ageing. 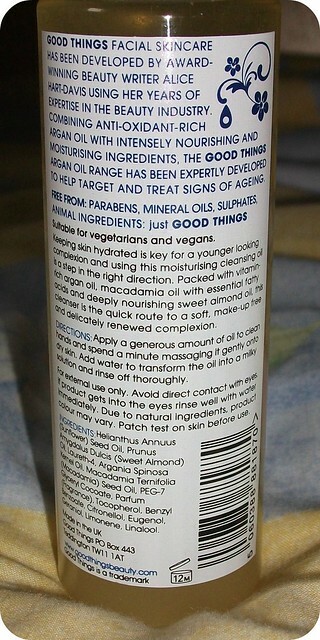 Free from: parabens, mineral oils, sulphates, animal ingredients." The bottle is quite nice, with pretty branding and plenty of detailed information about the product and how to use it; I have to say, though, that I'd prefer a pump to the flip-cap which requires you to pour out the oil, just because it's so much less messy! "Keeping skin hydrated is key for a younger looking complexion, and using this moisturising cleansing oil is a step in the right direction. Packed with vitamin-rich Argan Oil, Macadamia Oil with essential fatty acids, and deeply nourishing sweet Almond Oil, this cleanser is the quick route to a soft, make-up free and delicately renewed complexion. Directions: Apply a generous amount of the oil to clean hands and spend a minute massaging it gently onto dry skin. Add water to transform the oil into a milky solution, and rinse off thoroughly." I've been using the Good Things Argan Oil Nourishing Cleansing Oil as my second cleanse of an evening, after removing the bulk of my make-up with a micellar water. As suggested on the bottle, I dispense a little of the oil into the palm of my hand, then gently massage it in for a minute or so to ensure that any remaining traces of make-up and grime are dissolved. I then wet my hands to emulsify the oil into a milky solution, before removing with a dampened flannel or muslin cloth. The first thing I've noticed is the lovely scent of the oil, I can't quite put my finger on what it is but it smells beautiful, as well as feeling silky-smooth as I massage it into my skin. As I add water to emulsify, I can see the make-up and grime lifting away from my skin, and yet more comes away on my facecloth as I remove the residue. I generally follow up with a toner and only rarely do I find traces of make-up on the cotton pad, which reassures me that the Cleansing Oil is doing a good job of removing the day from my skin. In all, I'm really enjoying using the Good Things Argan Oil Nourishing Cleansing Oil and find that it works really well to remove dirt and leftover make-up from my skin. I have an oily skin-type but this doesn't seem to have broken me out or caused my skin to become any oilier, which is good! 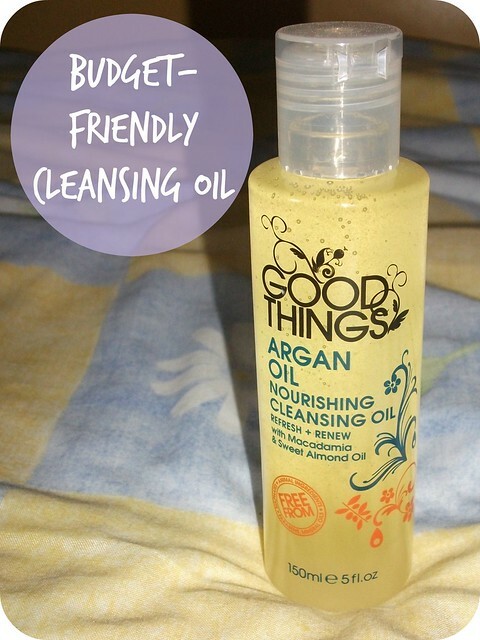 Good Things Argan Oil Nourishing Cleansing Oil is available from larger Boots stores, priced at £5.99 for 150ml of product, making it a budget-friendly option for those who enjoy oil-based cleansers, or those looking to try a cleansing oil for the first time. I'd actually really like to try more from this range as well - I'm loving the sound of the Facial Oil and the Moisture Boost Serum. Have you tried anything from the Good Things range? Do you like the sound of the new products with Argan Oil? Are you a fan of cleansing oils, or would you like to try one? I love using cleansing oils and balms, as my skin is quite dry and dehydrated. This one sounds like a nice, cheap one, so I'll definitely be picking it up next time I'm shopping! That looks nice, I love a good cleansing oil. Do you use a regular cleanser too afterwards? I do sometimes. It depends on the cleansing oil and how well it cleanses. I love using oils to remove my makeup, it breaks up everything so easily without tugging. This one sounds great, I'm not sure if I can find it in the U.S. though! ooo is this a substitue of my beloved Body Shop Cleansing Oil? I am super curious to try it!! I wish I could come to the UK to shop, here we don't have all these wonderful drugstore brands. Sounds very interesting, never tried an oil based cleanser! I LOVE a good cleansing oil! I swear by Shu Uemura, but it's a little on the pricier side so it's always nice to find new, more affordable, alternatives! I agree with you, though, I'd prefer a pump instead of a flip top lid as well.